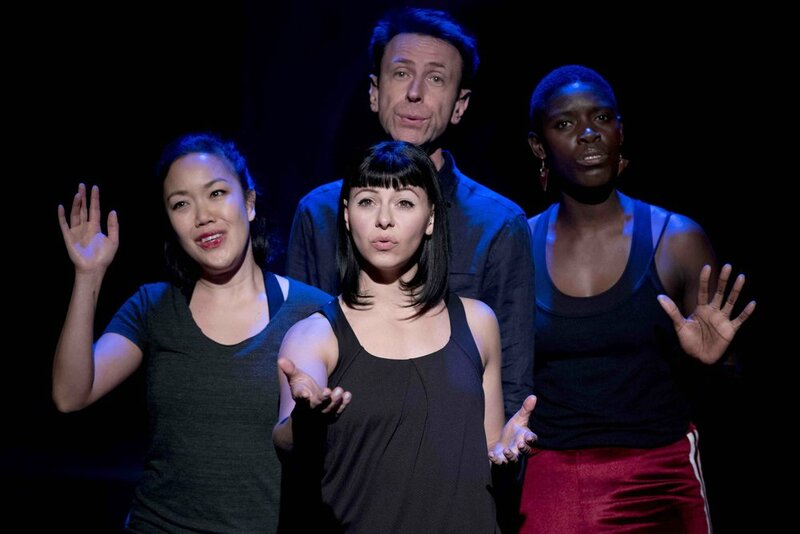 Clockwise from top: Lee Simpson- a white man, Anna-Maria Nabirye- a black woman, Jess Mabel Jones- a white woman and Vera Chok- an East Asian woman, sing out to the audience, gesturing earnestly with our hands. A woman presses her hands and face into a billowing transparent sheet. Lighting colours it purple, blue and pink. A layered shadow creates the figure of a strong-nosed statuesque footballer. A woman dances in a sequin leotard in front of a backdrop of crumpled paper. Shadows of miniature furniture and a vivid hot pink shape collage on the backdrop. The back of Jess Mabel Jones’ head and right shoulder are illuminated in the spherical glow of a puppetry stick light. An inviting hand reaches out of a sparkling silver slash curtain. Dazzling, watery light reflects onto the set’s wooden arch and paper screen behind. The shadow of a female figure appears like an animation in flickering, golden light. Jess Mabel Jones, Anna-Maria Nabirye and Vera Chok, dressed in black and white striped football strips, triumphantly cheer with arms raised. The shadow of a distorted building with rows of warped windows glows a fiery yellow and red. A new Improbable production in collaboration with Vera Chok, Keziah Joseph, Anna-Maria Nabiyre, Adrienne Quartly, Steve Tiplady and Jess Mabel Jones.